In this post I am looking at 5 new colours that will be arriving in the UK very soon including a densely saturated green called Eden ltd run. Bayou ltd run, Porpoise ltd run and Little boy blue ltd looked quite similar in rod form. 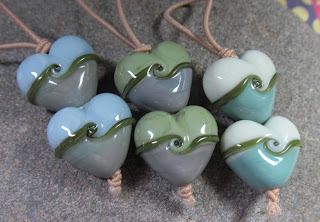 When used to make beads they are the most lovely green, grey and eggshell blue opaques. These colours are muted and lovely, like vintage paint samples. The hearts on the left are Bayou decorated with a layered cane of white and Gypsy, and vine cane made of Elphaba layered with Eden ltd run. The middle pair are Porpoise decorated a layered cane of white and Cleopatra and the same vine cane. The pair on the right are made with Little Boy Blue decorated with a layered cane of white and Midnight and the Elphaba/Eden vine cane. 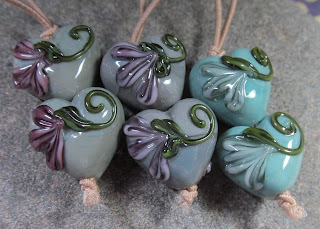 I've used these 3 colours again to make two tone hearts separated with a line of Elpaba/Eden cane. Left we have Bayou with Glacier which is my all time favourite blue. The middle pair are Porpoise with Weeping Willow (also coming out soon). From left to right the bead colours are Peppermint Cream/Bayou/Porpoise/Little Boy Blue. These textured ammonite beads have been burnished with fine silver leaf. The only glass showing a colour change reaction from the silver is The Peppermint cream bead. Eden ltd is a saturated deep green glass which looks close to black as a solid bead. I usually use CiM Loch Ness to make my layered vine canes but find I like Eden even more! It is an emerald green colour when pulled down into stringer over a core of vibrant green Elphaba. Eden looks black as a solid bead and so by way of giving a direct comparison I have made a solid bead and also put dots Eden over dots of Glacier inside this layered floral lentil to give the impression of big leaves behind the flowers (I have used Gypsy dots over Glacier dots to make the petals). 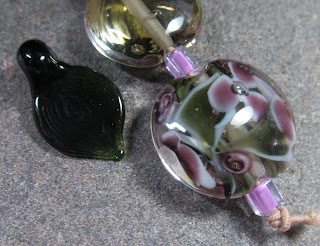 With Eden, a little glass will go a very long way in adding pops of colour to your beads.